When you are truly in love with someone there are some things you need to be able to express right from the heart. And why not? The heart has long been considered to be the center of all things romantic as well being the center of life and all things good. Many people say that when a couple gets married, their two hearts become one. So why not choose heart-shaped wedding day sparklers as part of your ceremony? With so many different venues no longer allowing smoke of any kind within their facilities, not all wedding day sparklers are safe for use indoors. 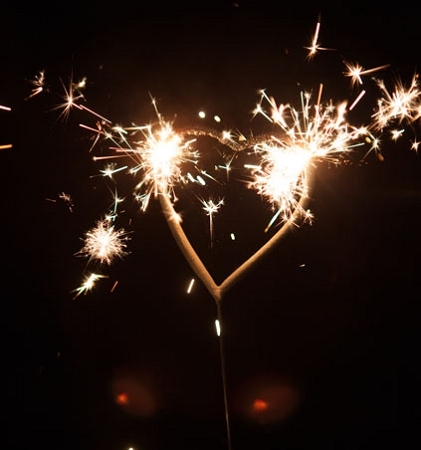 Our heart-shaped wedding day sparklers are smokeless and perfectly safe for indoor or outdoor use. Why not do something unusual and place one of these amazing sparklers at each place setting at your reception including one for the bride and groom? Then when it's time for the toast, have everyone light their sparklers to add a magical touch to the moment. After the ceremony, you need to find a way to make your exit memorable, one that your family and friends are going to talk about for years to come. Why not equip each of your guests from the younger ones to the oldest with wedding sparklers? They make a fantastic way to light up your path to the limo that is going to take you off to start your new life. Since the sparks are harmless, even the younger members of the party can enjoy showering the bride and groom as you walk down the path. If you are having an evening wedding the glow from the sparklers can be a very romantic way to light your way. While you can use standard wedding sparklers, they are not as romantic as those that are heart-shaped. When you share heart-shaped sparklers with your loved one, you are showing them that you care enough to step outside the box in your search for a unique way to show your love. The good news is that it does not have to be your wedding day for you to enjoy wedding sparklers. They make a great addition to a romantic dinner at home or a walk along the beach in the evening. The heart-shaped wedding sparklers are one of the best ways for you to show your significant other just how much you love them. Flowers can be a great gift, but heart-shaped sparklers offer a dazzling look no one can forget! No matter what the event is, never settle for going through the motions! Instead, why not celebrate your love and order a box of heart-shaped wedding day sparklers from Wedding Sparklers Outlet!